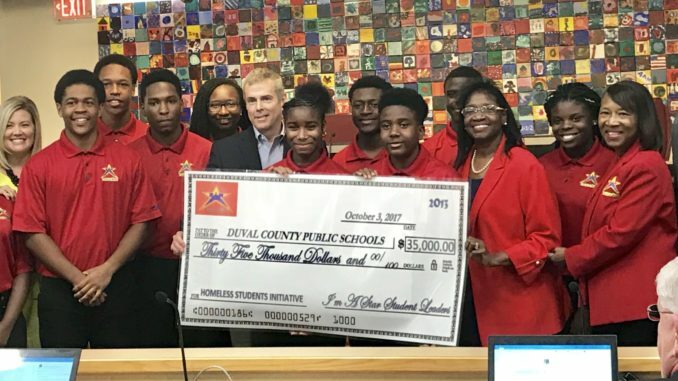 Teens in the I’m A Star Foundation presented a check for $35,000 to Duval County Public Schools to benefit the 2700 homeless students in their school system. 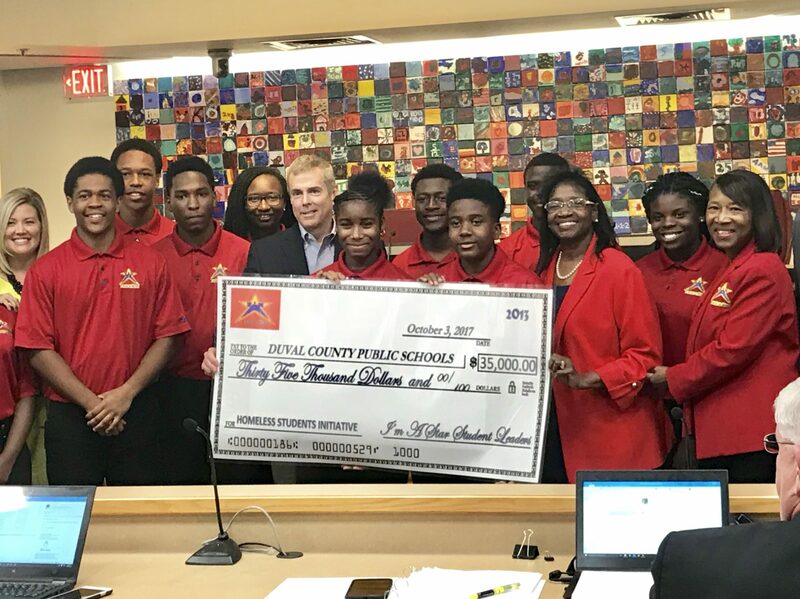 This marks a milestone total of $100,000 raised through the youth-led Jacksonville HELPS (Homeless Students Empowered through Leadership, Partnership & Service) effort since 2013. 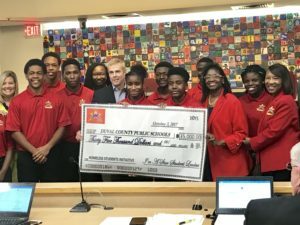 The teens spoke before last week’s school board meeting, thanking the community before delivering the funds. “The community stepped up in a big way,” remarked 16-year-old Jacksonville HELPS Co-Chair Joshua Brown. The young leaders kicked off the 2017 fundraiser in July, collecting funds through a Celebrity Basketball game, GoFundMe campaign and private donations. I’m A Star Foundation donated all money to the district as unrestricted funds, which will provide resources for students in the DCPS “Families in Transition” program. The $35,000 will cover needs such as eye glasses, books, toiletry items, bus passes, doctor’s fees, hotel vouchers, rental deposits, college application fees and more. This year’s Celebrity Basketball game caught the attention of USA Olympic Gold Medalist Simone Biles, who sent a video congratulating ‘I’m A Star’ teens. Established in 2010, I’m A Star Foundation is a non-profit organization comprised of students (ages 12-18) who develop solutions to improve their communities. An acronym for “Smart, Talented And Resilient” students, the Foundation draws 35 volunteer student servant leaders from middle and high schools across Duval County each year.